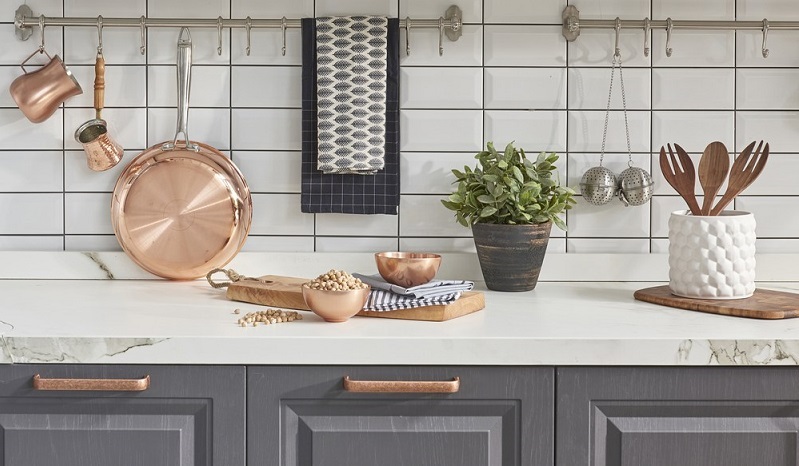 Metallic accents have been at the forefront of kitchen decor over the last few seasons as an easy way to transform the basic into the sophisticated. 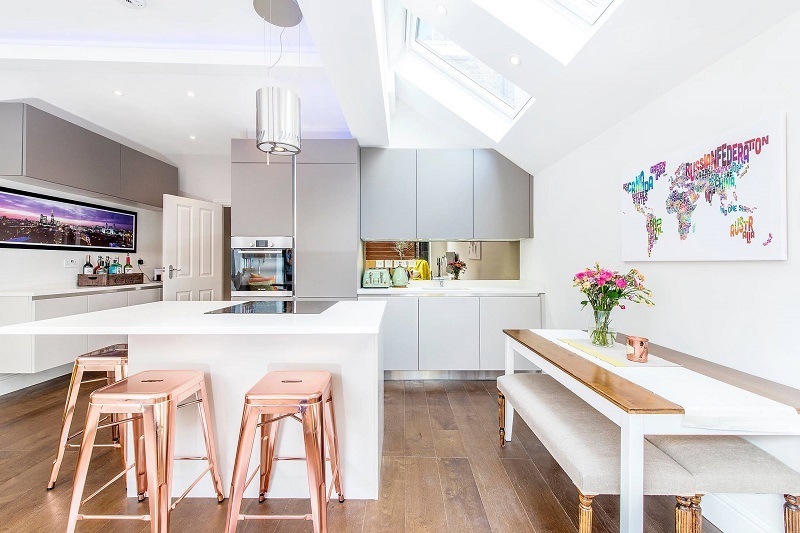 But lately its vast metallic surfaces that are sizzling hot and turning up in unexpected places like backsplashes, benchtops, islands and cabinetry. 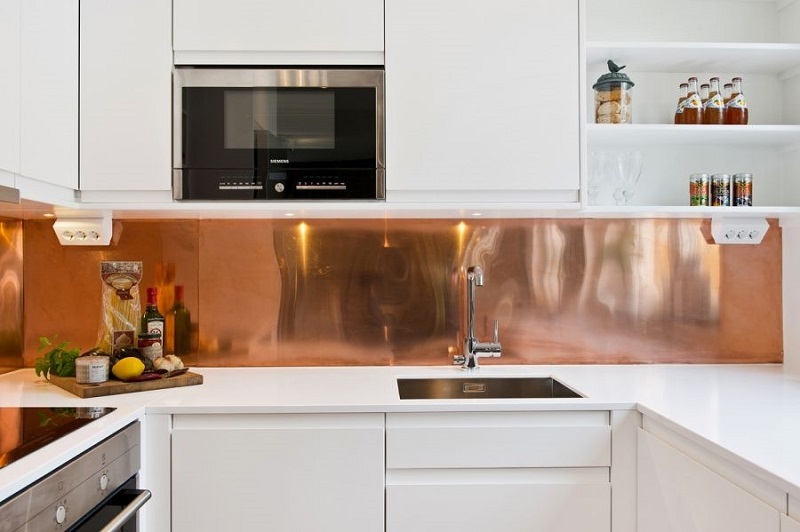 Luminous gold, brass and copper have the ability to be warm and tactile, bounce light and introduce a little bit of glamour to almost any type of kitchen. Here is some inspiration for those who want to elevate their space to gold status. 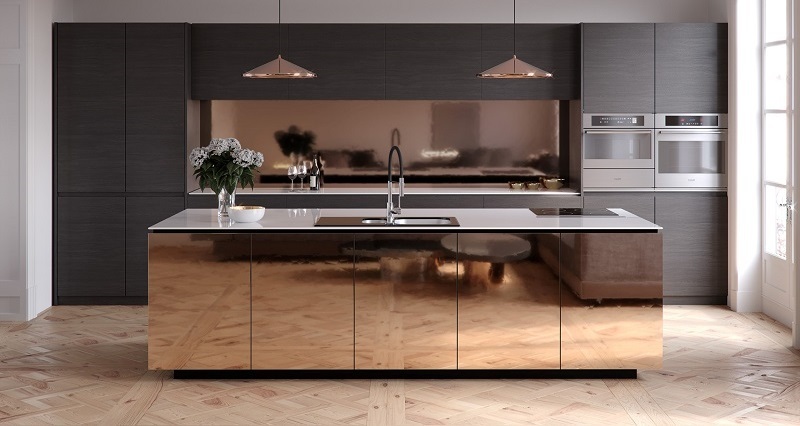 Fridges, ovens and range hoods – metal appliances can turn the ordinary into the extraordinary. Choose one show stopping large piece and accent with a few smaller pieces like kettles, mixers and toasters. If anything semi-permanent sounds like too much of a commitment, the easiest and most budget friendly way to bring the golden touch into your kitchen is with accessories. From tapware, faucets, lighting, knobs and handles through to flatware, canisters, pots and utensils – there are a million different ways to add sparkle. A glamorous splashback is the ultimate metallic statement, as gold-finished brick or a painted foil will make your kitchen positively glow. Copper is the warmest metal on the spectrum and is surprisingly practical as it is easy to wipe down and maintain. 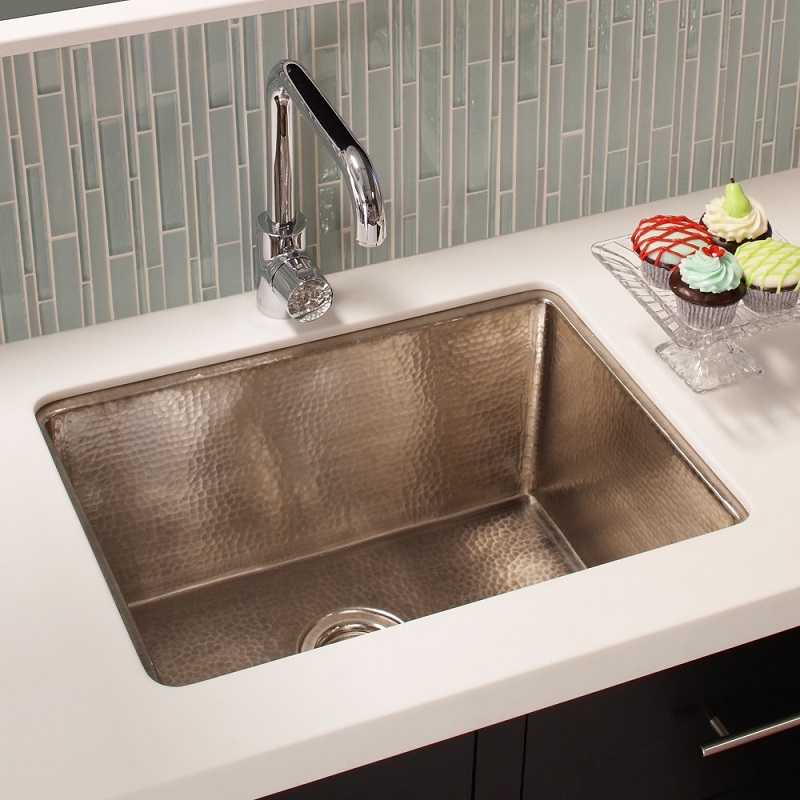 Complement your sleek metallic backsplash with wooden textures to create a rich, timeless look. 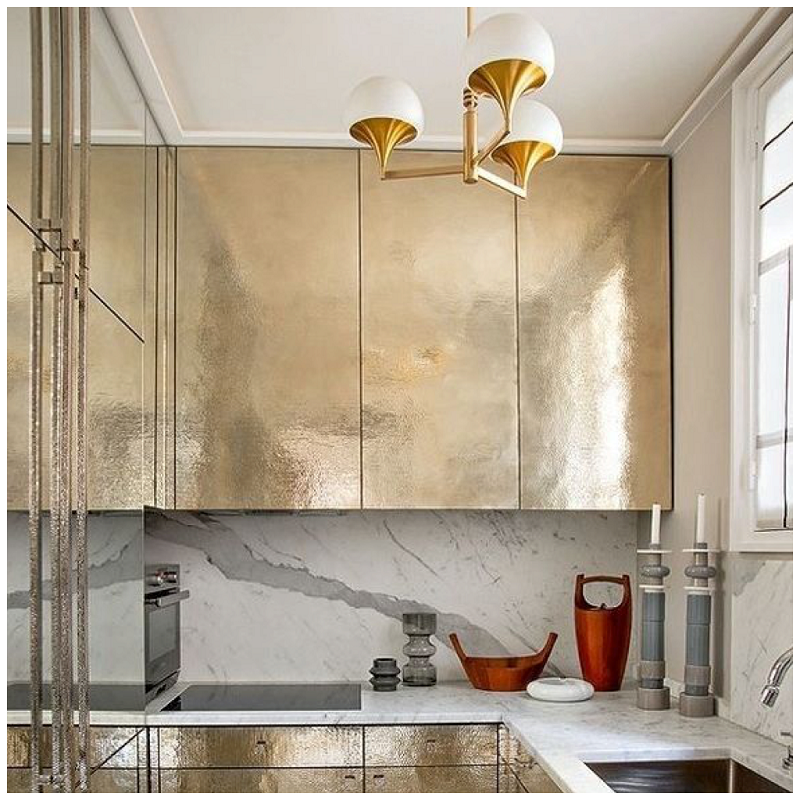 Accents are a nice way to dip your toe in the metallics trend, but why not be brave and fully commit and clad entire rows of cabinets in reflective gold sheeting, gloss lacquer or glass metallic finishes. Just remember that the more detailed your kitchen cabinetry, the more considerate you need to be of the rest of your kitchen’s palette. Seating in your kitchen is another creative way to add a splash of metal into your decor. If you have a bar or island, a metallic stool can truly shine. The legs of dining chairs or tables can look luxurious if they are metal or painted with metallic colours, especially when paired with white or dark neutrals like grey and charcoal. Choose a warm hued metal like rose gold. Want a stunning focal point in a kitchen? 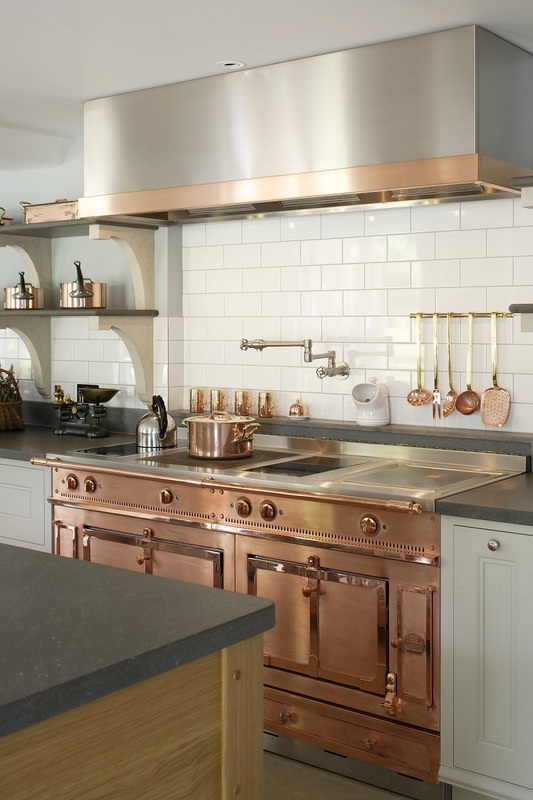 Forget stainless steel and go for copper, gold or bronze sinks. Copper has natural antimicrobial properties and the ability to resist a wide range of bacteria, making it a great choice. It is also the perfect material for those who appreciate the evolution of natural materials, as it develops a patina over time. For more kitchen design trends, ideas, expert advice and products, or any other renovating projects you have coming up, make sure you visit the Auckland Home Show, 5 – 9 September 2018 at ASB Showgrounds, Greenlane, to get free expert advice and design guidance from more than 500 leading industry experts and suppliers. See www.aucklandhomeshow.co.nz for tickets and more info!